The Nissan Zaroot concept was debuted at the 2005 Geneva Motor Show where it received such positive attention Nissan decided to develop the concept further. 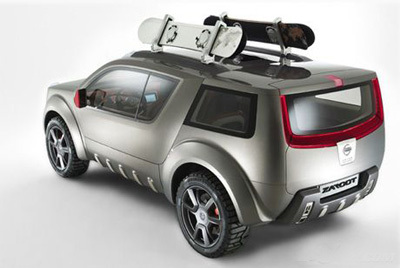 And although the Zaroot itself will not make production, many of its features will be used by future Nissan models. 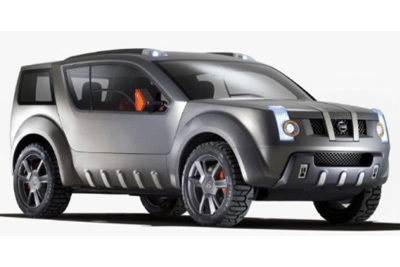 The Zaroot is based on the Nissan X-Trail mechanicals and is intended as a combination of off-roader and sportscar. 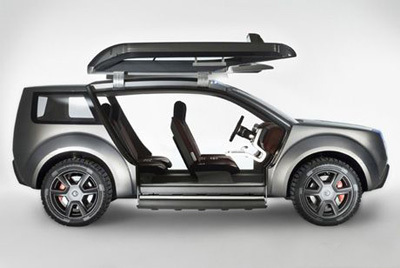 The somewhat radical, yet feasible, exterior design of the Nissan Zaroot is dominated by the bulging cabin complete with gull wing doors and electrically lowered side sills. Inside, the stunning interior is complimented by wafer-thin seats, increasing available space. And a high -tech floating center console housing the gear selector and an LCD screen. The Zaroot is powered by a 134 bhp, 2.2 litre, 4 cylinder diesel driving all four wheels. Transmission setup is geared more toward on-road driving, and with firmed up suspension the Zaroot's handling characteristics are more car-like than other SUV models.